Villa with Breathtaking Golf Views | 7 Bed 7.5 Bath, 6,500 sq ft (600m), Stunning Contemporary Home with Two Games Rooms, Two Kitchens, Two Living Rooms! DISCLAIMER: Reunion Vacation Homes, Inc is an independently owned property management company that manages privately owned vacation rental properties. 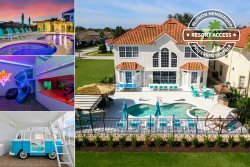 Reunion Vacation Homes, Inc is not authorized, affiliated with, sponsored by or related to: Reunion Resort & Club of Orlando, Salamander Hotels & Resorts or their affiliates. Lennar Homes and The Retreat Resort or Storey Lake Resort. Pulte Homes and Windsor at Westside Resort or Windsor Hills Resort. Park Square Homes or D.R. Horton and Solterra Resort. Mattamy Homes and Solara Resort. LIMITED TIME OFFER - TAKE ADVANTAGE OF THIS PROMOTION BEFORE IT EXPIRES! *Discount is automatically applied at check out. Rent 7 Nights or More & Get 10% Off! 6 Miles to Disney! This fantastic home is a dream location for family reunion's, corporate retreats or sports teams to get together and enjoy time together. Enjoy the benefits of the stunning main home and added privacy of a guest home. The unique top floor has been designed solely for entertainment, featuring a huge games room with full-size custom billiards table, Cinema room, wet bar and poker room! There is an additional second bonus games room in the garage furnished to a retro 70's style with Foosball table, Ping-Pong Table, and Arcade Machine. The adults can relax in the sun while the children are able to play close by. With three balconies offering breathtaking golf views and a private pool, this home truly has it all! You can make the most of the Florida sun with the large outdoor living space this home offers. From the extended pool deck to the rear patio and large 2nd and 3rd-floor balconies which face the golf course, offering some of the best views in Reunion. All of these areas are equipped with patio furniture. The pool is fitted with a child's safety fence and the large private pool deck is perfectly located in-between the main house and the guest house. As you enter the beautiful foyer of the main house you will notice the stunning polished ceramic floor, the flawless modern decor, and the light flooding into the open floor plan from the wall of large glass doors. The modern fully equipped kitchen with its granite counter tops and top of the range stainless steel appliances is spacious and includes an island and breakfast bar. The living area has a beautiful selection of comfortable seating surrounding the large flat screen TV. The opposite is the adjoining dining area with its large table that offers seating for 10 as well as two bar stools. If you prefer al-fresco dining, through the French doors is a large sheltered patio with a selection of luxury seating and tables. Here you can admire panoramic views of the Grande hotel set behind the lush golf green and fairways. The ground floor in the main house is completed by a King sized bedroom, a powder room. The first-floor master suite undoubtedly has the wow factor with a custom King size bed. The wow factor is magnified when you enter the en-suite with its deep tub surrounded by granite surfaces. From the master, you have direct access to the balcony where you will experience breathtaking views and the perfect spot to enjoy breakfast in the fresh morning air. Two more luxurious bedrooms make up this floor with the same high standard of bed linens and decor, one has a Queen sized bed and the other has two Queen size beds. Every one of the inviting bedrooms in the main home has an en-suite and a TV. The entire amazing third floor, decorated with vibrant retro Marimekko fabrics, has been designed to be the perfect space for fun, entertainment and relaxing. You will enjoy spending time on any the spacious balconies, admiring the panoramic views of the golf course, perhaps during a golf tournament. Also on a clear night, you will be treated with views from a distance of the Disney Fireworks. The cinema room has seating for eight, set over two levels for the best viewing experience. Once you dim the lights, the projector and surround sound system will truly make you feel like you're at the movies. For your convenience, there is a separate laundry room with a washer and dryer, sink area, iron, and ironing board. The luxurious decor of the main home has been extended into the guest house, which has a king size master suite on the ground floor and a bathroom. Upstairs there are two Queen size bedrooms, a shared bathroom, open living/dining area with a TV and a kitchen. This home has all the ingredients to entice you into a relaxing holiday mood as soon as you enter. Luxurious decor and breathtaking panoramic views are the ultimate in luxury and style. All of this is located in the exclusive Reunion Resort, a truly beautiful place with world class amenities such as infinity pools, a full-service spa, scenic walking trails, fitness center, on-site fine dining, kids’ activities and much more. *THE ELEVATOR IN THIS PROPERTY IS NOT AVAILABLE FOR GUEST USE. No hassle with key pick-up! Drive straight to your vacation home! Finest homes at affordable rates. Pool heat available for $40 a day and is recommended from the 31st Oct. to the 31st Mar. This property does not include a BBQ, however, we do have them available for rental. While staying in this property you and all of your party will be able to use the majority of Reunion's amenities such as 6 swimming pools, children's activity program, bike hire, boutique spa, on-site restaurants, and bars. Only if you wish to access an additional 5 of Reunion’s Pools including the Water Park and the Tennis or Golf will you need to be registered as a House Guest. There is a limit to the number of days that can be appointed to house guests. Therefore the house guest registration is not for the entire length of your stay, just the specific date(s) you wish to access the Water park, Tennis or Golf. There is a registration fee which is for one day. This is for you and all of your party - NOT EACH. If available, additional dates can be purchased. You are required to be registered for your desired date(s) at least 5 business days before your arrival. Once registered, your dates cannot be changed, the passes cannot be credited or reissued even if the water park is closed for any reason or if they are not collected or used. Once you are registered you and all of your party will be able to access 5 additional pools including the Water Park, Golf, and Tennis. Each of these activities requires an additional fee, the Water Park is $18 per Adult and $12 per Child payable at the entrance, Golf is $120 per person during low season (Jun to Dec) and $180 per person during Peak season (Jan - May) and Tennis is $20 for one day. From the resort pools to Reunion's fine dining, outdoor activities, and beautiful Florida settings, Reunion is sure to make your Orlando vacation a special one. All of this is ideally located to some of Orlando’s best shops and restaurants – and just 6 miles to Walt Disney World! *Water park, Tennis, and Golf access is limited and subject to house guest privileges which should be pre-arranged. The professionalism prior to booking and after booking was great! Jasmine, Robert and Dean were great! Golf course view from the bedroom and 3rd floor terrace were lovely. Overall we had a wonderful stay it was such a beautiful home. Very spacious and well equipped. Its definitely worth every penny spent. Cant wait to book this home again for my family! Jennifer was amazing, from beginning to end. We could not have been more blessed for a rep. Every issue was dealt with professionally and promptly. Great house, great location, great value for the amenities!!! Our short stay at Reunion was very enjoyable. We didn't have to venture out of the house too much. The location, the views, the amenities, the decor were fantastic. I would love to find out who did the interior decorating. I would definitely recommend this home rental for any family to enjoy quality time with each other. I would also return to this home if we visit again. The Liberty Bluff section of the exclusive community of Reunion boasts fantastic golf views of the Arnold Palmer Legacy course. Contact Reunion Vacation Homes Inc.